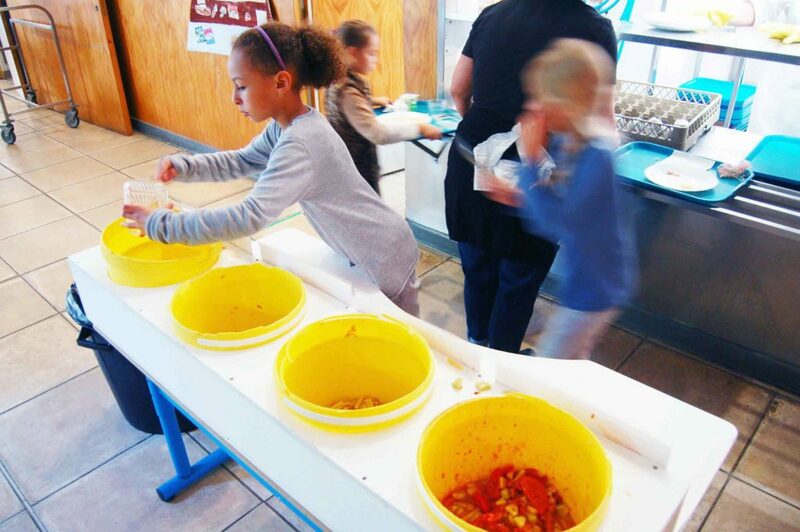 Since 2010, children sort the leftovers themselves. This educational reflex does not make any difficulty. 147 grams per plate: a third of a plate is thrown in France (national average according to Ademe organization). The guests from Mouans-Sartoux went to 32 g in four years (2011-2015)! This is a national record, which the city has managed to achieve, by making a lot of awareness and practical work. The cooks play a key role, the orders are finely adjusted. Also every day, buckets receiving the uneaten remains are sorted, weighed by the kitchen crews. The figures are plotted on charts that agents sift through. What kind of foodstuffs are rejected, what volumes go to monitor: little by little, the canteens reduced by 80% the amount of bio-waste. The fermentable remains go back to the municipal farm where a vermicomposting station turns them into organic fertilizers: perfect for free inputs in the crops! This also means less to pay on the municipal waste bill. The drastic reduction of food waste allowed to earn around 20 cents of food purchase per meal, some money reinvested in the food market to reach 100% organic at constant costs.